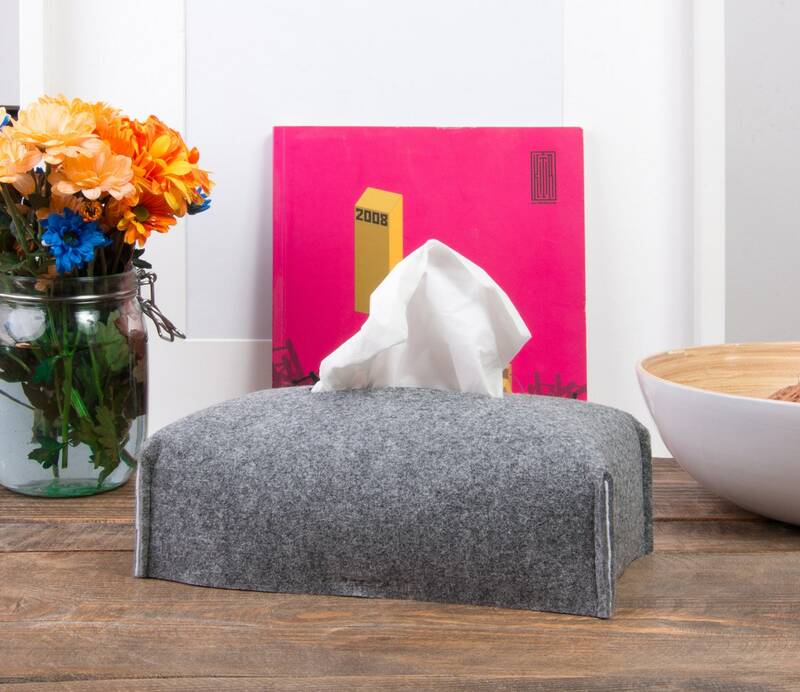 Tissue box cover made of light grey felt. 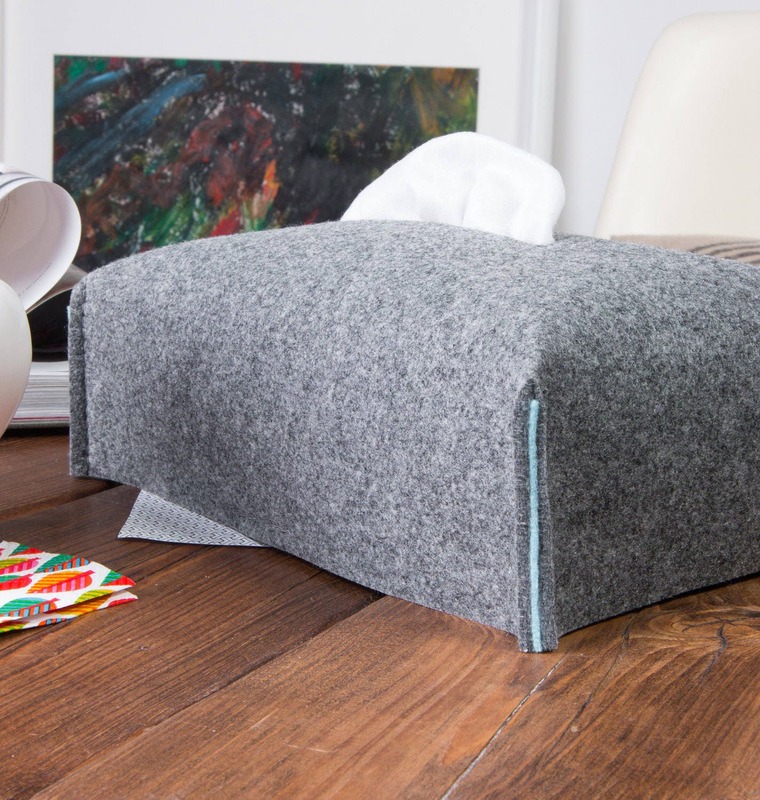 Available with various color corner lining. 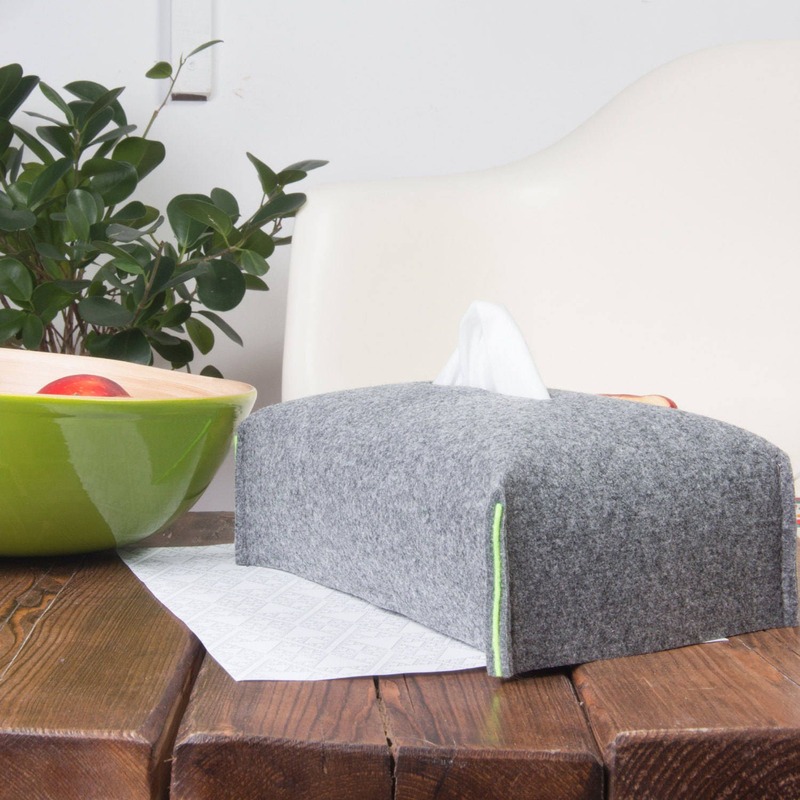 You can choose from three different tissue boxes size standards. 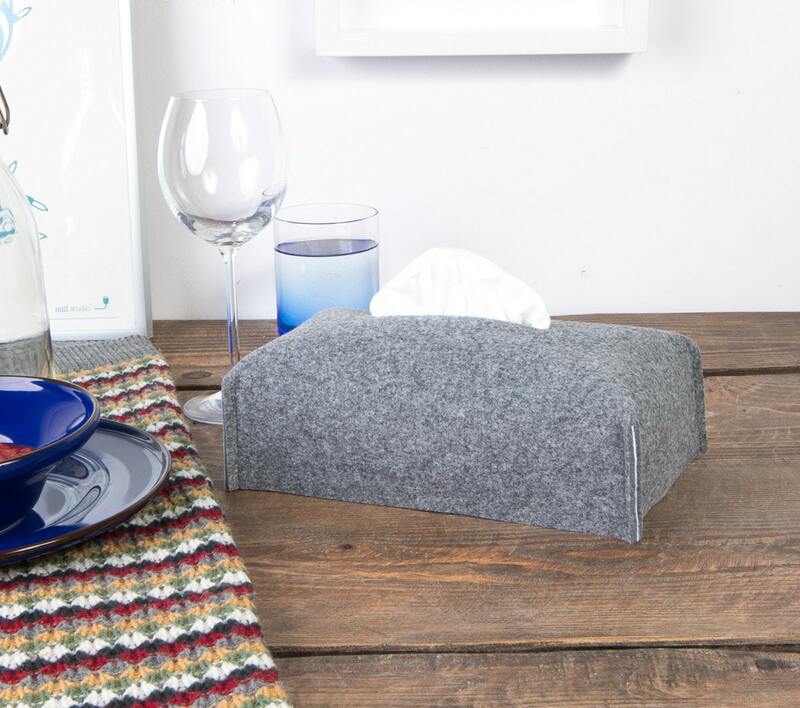 Great housewarming hostess gift idea. This item will be delivered worldwide by FedEx Express in 2-7 days. Request free size adjustments if you need custom dimensions. Please provide your contact number at check out for us to fill in the FedEx form to avoid any delays or shipping exceptions. To fulfill your order, you must provide me with certain information (which you authorized Etsy to provide to me), such as your name, email address, postal address, payment information, and the details of the product that you’re ordering. You may also choose to provide me with additional personal information like your contact phone number (for shipping provider ex. Fedex Express to avoid possible exceptions that may occur during international shipments) and the list of custom modifications of the product that you’re ordering if you contact me directly (ex. engraving text details or your laptop dimensions, device brand name and/or selected specification details). If you order a product intended for someone else (ex. birthday gift for your best friend) you may also provide me details about this person such as her/his name, email address, postal address and/or the details of the greetings card or personalized (engraved) tag which you wish to attach to the product. - Service providers (ex. FedEx Express). I engage certain trusted third parties to perform functions and provide services to my shop, such as delivery companies. I will share your personal information with these third parties, but only to the extent necessary to perform these services. I may store and process your information through third-party hosting services in the US, EU and other jurisdictions. As a result, I may transfer your personal information to a jurisdiction with different data protection and government surveillance laws than your jurisdiction. If I am deemed to transfer information about you outside or inside of the EU, I rely on Privacy Shield as the legal basis for the transfer, as Google Cloud is Privacy Shield certified. WHAT IS MY ACTUAL SHIPPING TIME? I currently ship Worldwide within aprox. 2-7 days by Fedex Express. Be sure to provide me with accurate and reliable information if your product has the FedEx Express shipping option, i.e. full name, address, ZIP code. Please provide your contact number at check out to fill in the FedEx form. It will help to avoid any delays or shipping exceptions. Phone numbers will be used for delivery purposes only. I promise that I will never share, sell, lease, trade, or using phone numbers for marketing purposes. DO I COMBINE ORDERS? YES, SURE! 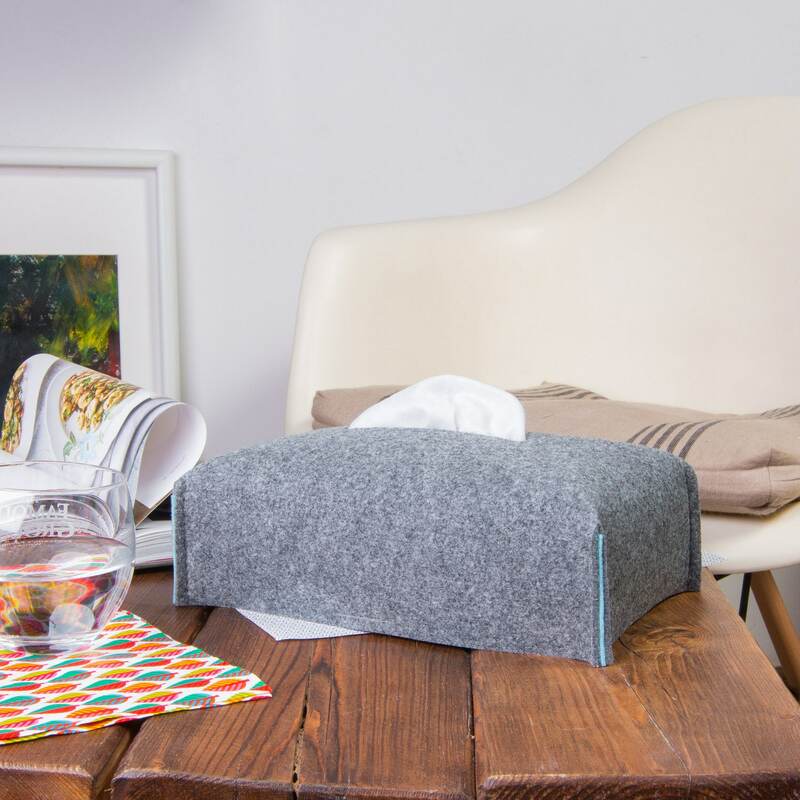 You can add more than one product to your cart without worrying about paying more for shipping. Items from multiple orders will be automatically combined into the same package to save your shipping costs. WHAT KIND OF LEATHER AND FELT I USE? I use natural full grain leather which was vegetable-tanned. This is the highest quality grade of leather. It comes from the top layer of the hide and includes all of the natural grain because it's not sanded in the tanning process. It's surface reveals natural imperfections, scars and marks which is normal and desirable. We call it the story of an animal written on its skin. Vegetable tannining is an old fashioned and natural process that takes advantage from the tannic acids naturally found in some plant species. Due to the tanning process the average length of it's life is considerably higher. 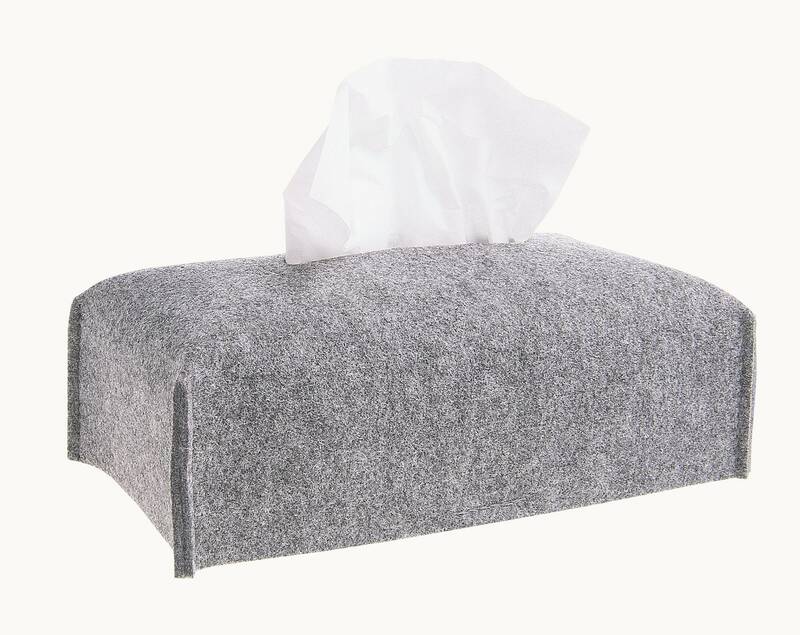 I use finest quality polyester felt made in Poland. It's top impregnated against large humidity. The material is not pilling. 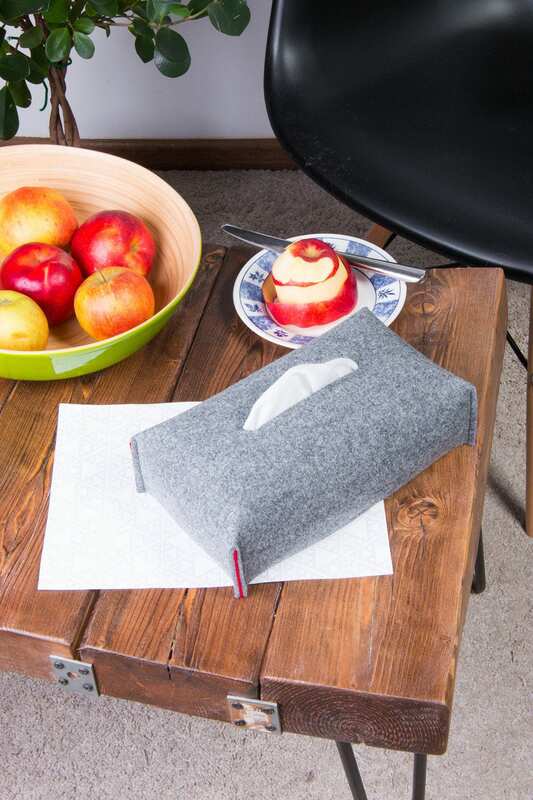 Standard felt colors: light grey or dark grey. For home decors I also use: intensive red, brown, oatmeal, dark blue, marine green. My standard items has silver buckles and rivets. You can request to change them for antique brass, gold or black. I have over 21 standard color possibilities but feel free to request any custom color you need. I'll try to help! IS IT POSSIBLE TO MAKE MY MONOGRAM TAG? SURE! You can personalize all items with a monogram and make them uniquely yours. We will put your name/initials on leather tag or label. They are made of full grain leather. Each characters are hand punched. Capital letters and numbers only. Recommended length up to 10 characters. If you order a personalized product, please remember to include the engraving text in the comments area while checking out. I can laser engrave your company logo or make synthetic label on each product. This option is only available for multiple orders and it's additional price need to be calculated individually. WILL I PAY ADDITIONAL CUSTOMS DUTY OR TAX? In most cases you will not pay any additional tax or customs duty for your order but sometimes your government may impose import fees and/or VAT on shipments from outside your country. You will be responsible for paying any custom taxes, fees and/or costs charged by carrier. To avoid the need to pay duty we would recommend you to check current de-minimis (duty free) import values for your country. I WAS NOT AT HOME AND I WAS UNABLE TO RECEIVE THE SHIPMENT. Please immediately contact FedEx Customer Service in your country stating the tracking number located on your order Etsy website or ask me to send it to you. Contacting the courier you have a chance to change arrange a new delivery. I DID NOT PICK UP THE DELIVERY, THE TRACKING SYSTEMS INDICATES THAT THE SHIPMENT IS BEING RETURNED TO SENDER. We will be very sorry, but if you do not pick up your shipment on time, after third notification it will be returned or abandoned. Unfortunately, in this case, you shall not be entitled to full or partial reimbursement of orders and shipping. We will not be able to resend the product. The cost of returning the package to us will significantly exceeded the cost of your order. I`m happy, very nice and quality! 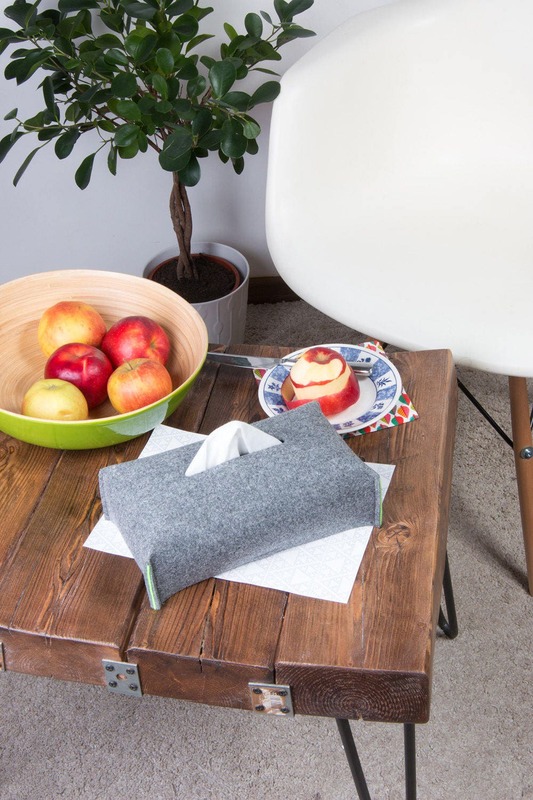 This is a lovely tissue box - makes the home look a lot neater (and cozier)! Very attractive and well-made box. 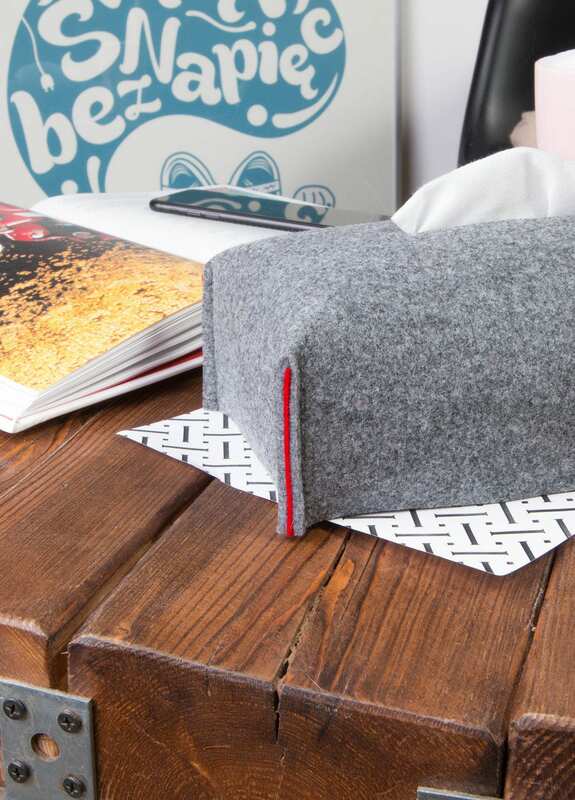 The grey felt with a subtle colour trim will go with any style of interiors. The seller was great to deal with and responded quickly and efficiently.